Thank you Paige Dashner Long for letting us use your fantastic arrangement, conducting, and giving your time, energy, and talents to this project. Thank you VFC participants for your video submissions from around the globe. Your dedication to making high-quality videos truly made the final performance a success. Thank you Skyler Butler for your beautiful work on the digital environment and final video. Through your innovation and imagination, we are able to embark a breathtaking journey to Ireland and through a museum of your own creation! What is the Virtual Flute Choir? The Virtual Flute Choir is an ensemble of flutists from around the world creating a single large-scale flute choir performance. How is this possible? Flutists submit videos of themselves performing various parts to the same piece and then they are all compiled digitally into one master performance! The piece selected for the 2013-2014 Virtual Flute Choir is Peter Martin's Mixing the Malt arranged by Paige Dashner Long. 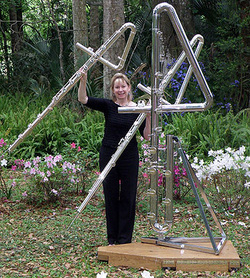 Paige Dashner Long is an internationally recognized flute choir director and contrabass flutist. Currently Ms. Long, an Altus Artist, directs the Metropolitan Flute Orchestra in summer residence at New England Conservatory and the Florida Flute Orchestra. As an active guest flute clinician and ensemble director, she has led workshops and directed flute ensembles for music schools in France, Germany and Mexico, as well as for universities and flute associations throughout America. She performs with the International Flute Orchestra, is the coordinator of the National Flute Association’s (NFA) Flute Choir Composition Competition, serves on the Low Flutes Committee of the NFA, served on the executive board of the Florida Flute Association and is past president of the Greater Boston Flute Association. As an active performer, Paige currently plays flute and harpsichord with the Daytona Solisti Chamber Orchestra and the Trinity Chamber Players. As an active teacher, she maintains a private flute studio. As an international ensemble performer, Paige has presented concerts in France, Germany, Austria, England, Wales, Ireland, Greece, Belgium, The Netherlands, Czech Republic, Russia, Finland, Estonia, Latvia, Poland, Slovenia, Slovakia, Hungary, Croatia, Chile and Mexico. As a lower flute specialist, she has written several articles for Flute Talk Magazine as well as for flute association newsletters throughout the country. In addition to her flute activities, she leads contemporary and instrumental music at Trinity Presbyterian Church in Palm Coast, FL, as well as directs and performs with the Trinity Chamber Players. Karen McLaughlin Large joined the Kansas State University music faculty in 2011 and teaches applied flute, music theory, flute methods, world music, and directs the KSU flute ensemble. Dr. Large earned her Doctor of Music, Master of Music, Bachelor of Music, and Bachelor of Science degrees as well as graduate certificates in Music Theory Pedagogy and College Teaching from the Florida State University. She studied with Eva Amsler, Stephanie Jutt, Joshua Carter (under Charles Delaney), and Mara Rose Rys. She is a founding member of Traverso Colore: Baroque Ensemble and performs with them throughout the U.S. She is also a member of the Florida Flute Orchestra, performing on the Sub Contrabass flute in G—one of only a few such instruments in the world. She has performed with the Tallahassee, Pensacola, and Northwest Florida Symphony Orchestras as a flutist and piccoloist. Some of her research interests include affective (emotional) responses to music, the role of musical analysis in performance, and baroque flute performance practice. She previously served on the music faculties at the University of Central Florida, the University of Tampa, and Indian River State College teaching various courses including applied flute, music theory, world music, and music literature. The 2013-2014 Virtual Flute Choir is funded by a research grant (USRG) from Kansas State University.